If content is so important for attracting readers, SEO and branding why do many blogs have so little of it? With all the Google algorithm changes in the past year the buzzword was content. It became vital to have fresh content on your site on a regular basis. Companies trotted out blog article after blog article but many forgot to pay attention to the most important element of that content - the content. Blogs need to be written for the reader, not the search engines. People come to your blog for information, and will likely come back if they find it. Concocting a blog post simply for SEO, packed with keywords and links but little useful information for a reader, is self-defeating. The whole point of SEO is to get qualified traffic to your site. Readers who come to your site and find a useless blog will leave quickly and never return. And with the increased emphasis on relevant content by search engines, they won't look highly on your site either. Below are our top 5 ways to get readers and get them to come back while optimizing your blog. Since content is what you are looking to provide, avoid spun articles. They accomplish nothing good. A spun article reads poorly and often makes no sense. It is there only for links, and it shows. Your readers will think you can't write or possibly even think straight. Not only will they avoid your blog in the future, they will probably avoid your company too. When crafting blog posts, grammar and spelling matter. Take the time to proofread your posts. Grammatical and spelling errors tell your readers that you didn't take the time to produce quality work. At best, they will think you are slapdash and careless. Others may assume you have delegated your work to a content farm located overseas. Readers often visit blogs for expert opinions and details about a subject. Take the time to research your topic and ensure that any facts you provide are accurate. Earn your reputation as an expert by providing examples and offering more detailed explanations. Once you become a trusted resource, your readers will return. Providing accurate information is only part of becoming a trusted resource. Develop a voice for your blog that is relatable and accessible. Even if you are blogging for your business, your blog should have a personality so readers feel it is a conversation not a dissertation. Humor is always welcome, when appropriate. The most successful blog voice for you will probably be one that is close to your own personality. Reflecting the core attributes of your company's image, such as integrity or whimsy, in your voice will also strengthen your branding. Most importantly, respect your readers. They know that your blog is there to bring traffic to your site but don't want to be swamped with sales pitches and promotional copy. If you can catch the readers' interest, they will delve further into your site where self-promotion is expected and accepted. By keeping your readers top of mind when writing you will produce blog articles that are interesting and informative, bringing readers back to your site and increasing rankings and backlinks. 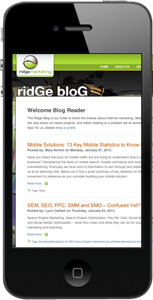 If you need help cranking out blog posts, Ridge Marketing's writers and NJ SEO experts can help.